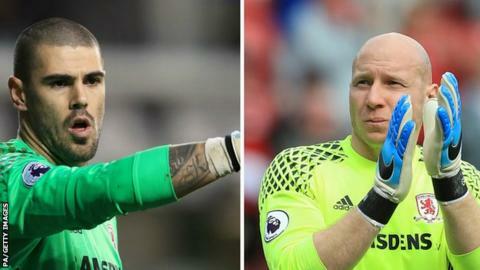 Middlesbrough goalkeepers Victor Valdes and Brad Guzan are both set to leave the relegated Premier League club. Valdes, 35, will leave Boro at the end of June after his deal was terminated a year early by mutual consent. Guzan, 32, had already agreed to join MLS side Atlanta United in January. Boro also announced the departure of their head of recruitment Victor Orta, while striker Alvaro Negredo posted a message of thanks to the club's fans as his loan from Valencia came to an end. "I go with the sadness of leaving the club in a place it doesn't deserve and with the certainty that you will go back where you belong, the Premier League," he wrote on Twitter. Middlesbrough are yet to appoint a permanent manager, with former assistant Steve Agnew having taken temporary charge following the sacking of Aitor Karanka in March.